Winsor & Newton Professional Watercolour Paper is made in France on a traditional cylinder mould. 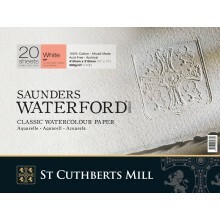 This luxury watercolour paper is made from 100% cotton and is naturally acid-free and archival. It does not contain optical brighteners and will remain competely colour-stable if kept in the right conditions. Winsor & Newton Professional Watercolour Paper is both internally and externally sized. This means that the size (a barrier layer which stops paint soaking into the surface, saturating the fibres and bleeding laterally) is added to the cotton pulp mixture before the sheets are formed in the mould, and again to the surface of the sheet. Paper which has been internally and externally sized will not warp when it is subjected to heavy washes or multiple paint layers. This paper is available by the sheet, in a 5 x 7 inch spiral pad, and in blocks. 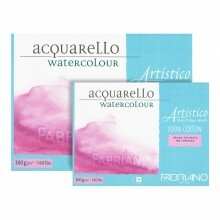 It can be used with watercolour, gouache, ink and acrylic paints. This is a block of twenty sheets of Winsor & Newton Professional Watercolour paper. The 300gsm sheets measure 10x14in. Please note, this product has a Not (cold pressed) surface. The surface of the paper is slightly textured, and is not suitable for extremely detailed work. Most painters will find it suitable for most purposes. For more information on the production and properties of watercolour papers, please see this article on watercolour papers on the Jackson's Blog. Please be aware that this is a block, not a pad, of watercolour paper. A watercolour block is a pad of watercolour paper that has been glued on all 4 sides. The sheets of paper are bound while they are wet, which means that they dry flat, and when they are used, the binding keeps the paper flat regardless of how much fluid watercolour is applied to the surface. Watercolour blocks are therefore very practical because there is no need to stretch your paper before work. Wait for your painting to dry before cutting the top sheet away from the block with a blunt knife such as a letter knife or a butter knife.